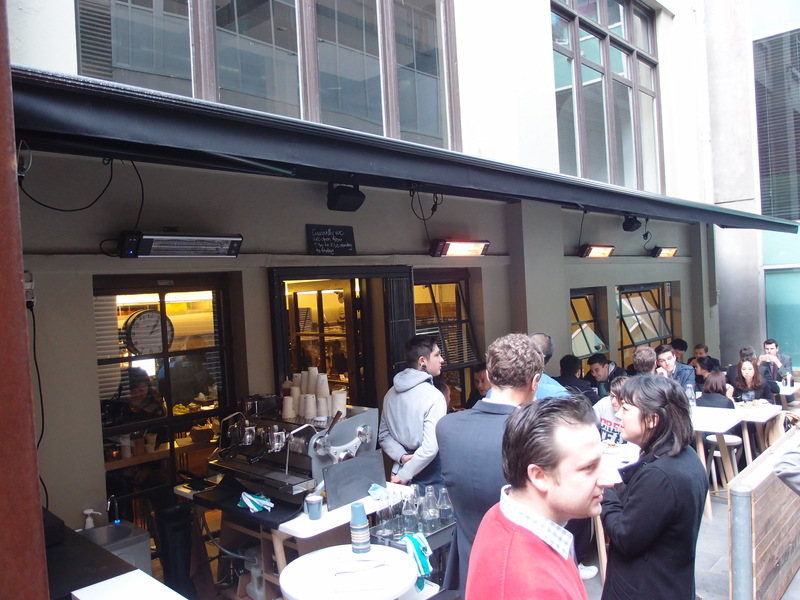 Melbourne’s obsession with New York City – tacky or tactical? There have been many coinciding trends between Melbourne and New York City for years now – our obsession with the colour black, the rise in street art, the mystique of the underground, and ‘impossible to find’ alleyway exclusivity have all grown rapidly since the early 2000s. Despite these similarities, New York City has a quintessential theme that cannot be replicated. Old New York will only live in New York (although it’s comparable traditions to Old Paris) and in essence, can never be in two places at once. This trend, across many cities around the world has stuck Melbourne as we see a new culinary phase turn up on our doorstep – long live the Mexican, Thai and Souva craze of 2000s as we move onto the ‘New York eatery’ of 2013. Open just a few weeks, the latest project by the folks at Hardware Society (and friends) have hit the nail on the head in their well researched attempt to bring NYC traditional cuisine to Melbourne. The fit out assumes a typical NYC subway station – low to the ground, rustic – with quirky subway signs and archetypal white bathroom tiles and wooden panelling, line the dining and kitchen areas, large clocks and even larger chalk boards dominate the walls. 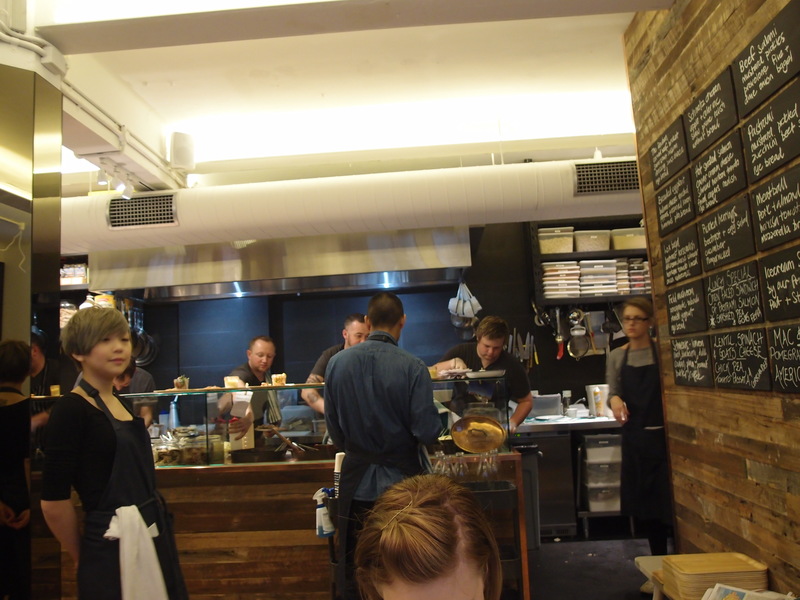 The space is clean and fresh and their choice in a light to dark colour scheme (how New York); is dominated by the kitchen area and lines of eager take away patrons. Breakfast bagels from New Yorkers 5&Dime fit with an optional “schmear” of spreads are available each weekday for breakfast from 7.30. Daily, cooked breakfasts are also on offer, mixing the sweet and savoury American breakfasts – maple and egg – together in one huge plate. A large three-by-four blackboard square dominates the rear wall, listing the full menu as well as tasty daily specials. The deal is this; choose a sandwich and then “lunch meal deal” it. 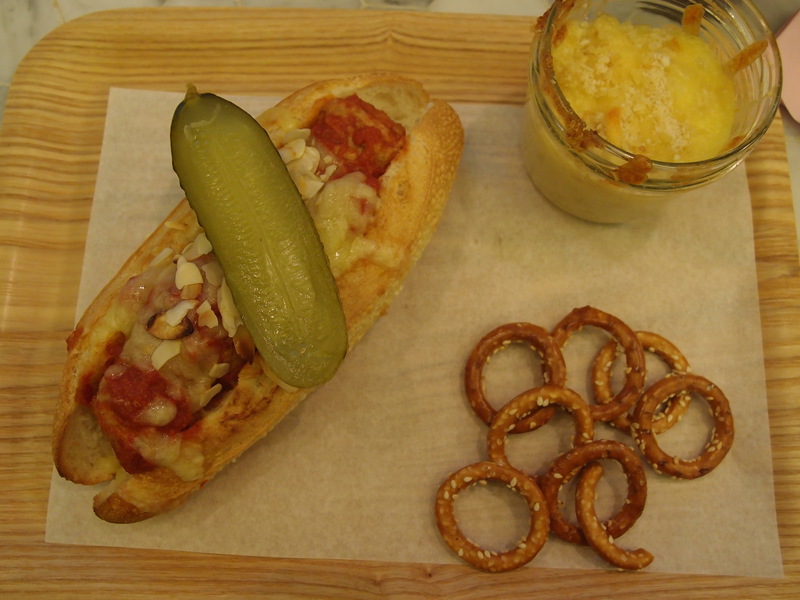 This means that you have a selection of sides to choose from to accompany your sandwich (served in tiny glass jars), which together is served with a pickle and pretzels on a board. Yum. I chose the Meatball lunch deal with a side, pretzels and pickle. The sides vary each day and include macaroni and cheese, lentil, caramelised onion and spinach salad, chickpea salad and cob salad (soon to be served traditionally with blue cheese). 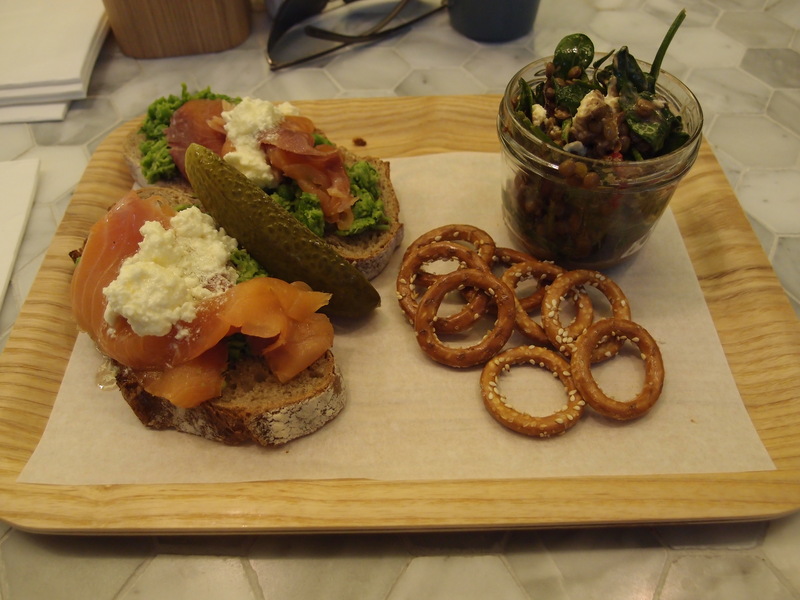 My lunch date chose a mushy pea, smoked salmon, feta special of the day and together they were heaven in each bite. At first I didn’t think I’d be full enough but how wrong I was as I tried to squeeze in the last bites of my sweet but savoury meatballs cooked in just enough Napoli sauce and covered in the perfect amount of melted cheese. I’m glad I left room for the deserts – all American key lime pie, pumpkin pie, pecan pie, smore’ brownie and of course New York cheesecake baked fresh each day and one hundred percent accurate. To top it all off, the coffee is Padre Coffee and is served with a side of Hershey’s – Kisses for coffee, and a Peanut-Butter-Cup for the hot chocolate. The flat white and the long black were both well rounded and balanced with just a hint of bitter sweetness. 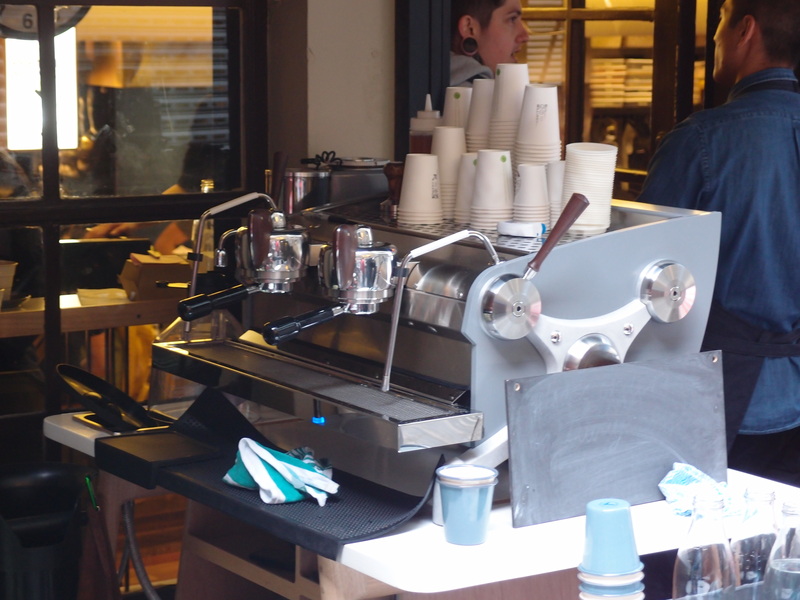 Armed with twoLa Marzzoco Strada– a two group stationed outside for the morning rush and a three group, inside for patrons, it is hard to go wrong. The space of Bowery to Williamsburg moulds into the surrounding environment like it has always been a part of the cobbled stones synonymous with Oliver Lane. So does NYC work in Melbourne? Is it copycatting? Are we out of our own ideas that we steal everyone else’s? Yes – to all of the above, but I don’t care. We are comparatively, a young city, isolated from the rest of the world. We believe in the saying ‘if it ain’t broke don’t fix it’ and why try and fix it’? Nothing is needed to ‘fix’ Bowery to Williamsburg. It is a slightly kitsch attempt at New York City, which serves truly fresh and tasty food. I don’t think anyone can complain, not even travelling New Yorkers.